This growing concern was converted into a limited company, with Samuel Fox as Chairman and Managing Director, and this son of Bradwell became known the world over as the inventor of Fox's Paragon Umbrellas. A witty commentator once observed: "I should say that Mr. Fox had the Peak to thank for some of his commercial success. He was born in the Peak, (where) the rain-clouds are always gathering - What more natural, than (he) should turn his attention to umbrellas”? He was a frequent visitor to his home village, took interest in most things connected with it, and for many years regularly sent large sums of money to benefit the poor. These charitable donations were always sent anonymously, and it was only a few years before his death, on 25th February 1887 in Stocksbridge, that the actual donor became known to the people, when he also bequeathed a further £1000.00 for the poor of the parish. Though Samuel Fox is credited with inventing the world’s first successful collapsible umbrella frame, the true inventor was actually a friend and employee, Joseph Hayward, but Fox’s company was entitled to all production rights and profits. Joseph Hayward was born in 1819, in the now lost village of Derwent (submerged under Ladybower Reservoir). 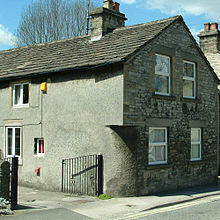 By 1841 he was living in Hathersage and working for Samuel Cocker & Son, Wire Drawers. One of his fellow apprentices was one ‘Sammy Fox’ of Bradwell. Around 1845 the two men moved to Stocksbridge, where Fox set up a wire drawing business and Hayward became one of his first few employees, acting as a draughtsman. Fox’s appreciation of his loyal friend is shown in a delightful old story: One day a worker found Hayward sitting with his head in his hands; the man hurried to tell the boss that Hayward was sleeping on the job. Fox told the informant to mind his own business with the words, “Thee go and mind thy work; he’s worth more to me asleep than thou art wakken”. Hayward, who was interested in designing new machinery, was responsible for the department making umbrella ribs. At this time some umbrellas still had whalebone ribs, but Fox’s company made them from steel. Hayward worked on further improvements, and his superior ‘Paragon’ design was patented in 1852. 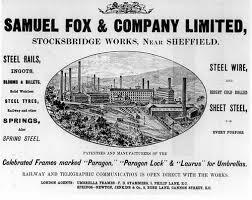 Profits from umbrella frames enabled Fox to concentrate on other products, such as crinoline wire. Crinoline dresses were the height of fashion, and their enormous wide skirts depended on a strong, light frame. Fox’s profits from crinoline wire alone reached £80,000. The two old friends eventually went their separate ways after Hayward invented a self-closing umbrella frame. Fox didn’t want to produce it, so Hayward went into partnership with another employee, and the design was produced by William Hoyland & Sons well into the following century, being in great demand from overseas. Joseph Hayward eventually returned to Stocksbridge, and worked there until about three years before his death at the age of 81. He had been responsible for most of the patents behind Fox’s world famous umbrellas, with their trademark of a running fox.